Can you imagine if these two teamed up in college? Randy Moss, an analyst on FOX Sports 1’s "FOX Football Daily," joined The Peter Schrager Podcast on Tuesday and, among many other topics covered, told a great story from his high school days. He was a skinny wide receiver from West Virginia getting interest from numerous Division I programs. 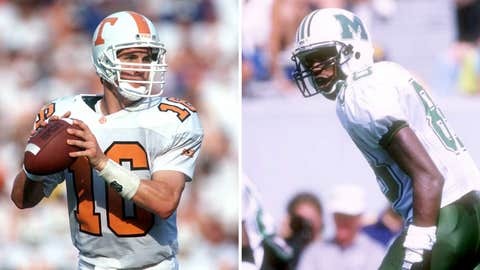 Tennessee — the school of quarterback extraordinaire Peyton Manning — was one of them. The Vols turned to their recruiting closer when they had Moss on campus for a visit one winter. What happened? We’ll let Randy tell the story. Click below. Randy also talked about Tom Brady, his favorite receiver, how he could still play in the NFL if he needed money and other topics with Schrager. To listen to the full podcast, click below.